Once the Bernese Mountain Dog has survived its puppy stages, it is a large canine, but very sweet and relaxed in their mannerisms as full grown animals. They can be much more loyal and caring then other breeds and adore nothing more than spending time with their owners. They can be quiet around strangers that enter their homes, but are exceptionally well behaved around little ones making them a great family pet for any home. They also have a reputation for being very easy going residing in the same home with other pets and other canines as well. They can tend to become frustrated if left out of the plans away from their families all day long as they enjoy being apart of the fun too! The Bernese Mountain Dog is one that enjoys playing outside. They can easily engage in outdoor activities for hours in colder climates as well. As far as exercise requirements are concerned this dog is fairly simple as it only needs a brisk walk or hike with their leash to be fulfilled. They enjoy playing and pulling on things such as a rope as well. This particular type of dog is one that enjoys being in the company of their owners so much so that they do not do well when left alone and separated from the action. They love playing outdoors as well, but should not be left unattended there either. Considering this is such a large dog once it is an adult, it may not be suitable for residing in a small space such as an apartment. A large home with adequate space to roam around in during the day is ideal. As far as grooming is concerned, they need a regular brushing once or twice per week and more often during the shedding season. 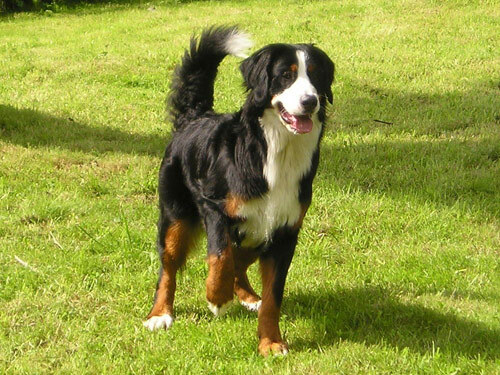 The Bernese Mountain Dogs have a tendency to develop CHD, cell tumors, gastric torsion and elbow Dysplasia as they age. Some minor areas of concerns can be in the form of SAS, entopion, ectropion and cataracts. In rare occurrences they can be known to develop PRA, vWD, allergies, overactive thyroid, hypomyelination and hepatocerebellar degeneration. The vet may recommend screening for their hips, elbows, eyesight, cardiac screening and testing for their vWD and DNA as well. Be very cautious with this breed in warmer climates as they are quite sensitive to heat stroke. The average lifespan for a Bernese Mountain Dog is on the short side between six to nine years long. They generally weigh between seventy and one hundred and twenty pounds as full grown canines. It is believed that the Bernese Mountain Dog derived from Switzerland during the time of the Roman Invasion. They are thought of as a result of the cross breeding between guarding canine and the Roman Mastiff breeds. They quickly made excellent herding dogs that were strong enough to withstand any cold winter conditions. The Bernese was first noticed in the United States in the early nineteenth century around 1926. They have since obtained their recognition by the AKC and have been known as a great family pet.